Yamaha Motor Philippines presented its Big Bikes as the Pioneers of Emotion. Aside from power and performance that is surely delivered, these motorcycles immerse you in an unforgettable experience that is fueled by passion. These machines were exhibited in the recent 2018 Motobuilds Pilipinas and they did not disappoint. It was a full house at Hall 1 of the SMX convention center where the community of Big Bike riders and Builders all came together. On display were the XSR900, Tracer 900, MT-09 & 07, Super Tenere, and the TMAX. The highlight of Yamaha’s booth was the heritage model SR400. The classic model was perfect for the event because it can be enjoyed as it is for those retro lovers; and is a great base for builders to show off their creativity. It was awarded the honor of Bike of the night, outshining the entire roster of the show. The ‘lane splitter’ design was created by renowned builder Benjie Dompor. The model was also awarded 1st place in the 400cc café racer building category. 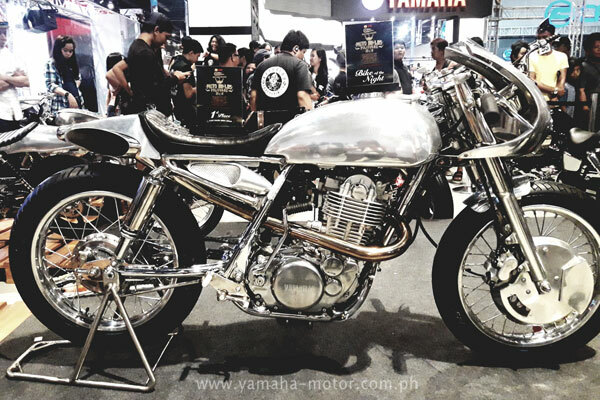 The Yamaha SZ was featured in the Build-Off Battle of Champions that was won by Noel Marfori against past winners Todee Teodoro and Jorge Jacinto. His rendition of the remastered SZ was stunning to say the least. Be part of Yamaha’s Big Bike culture with its entire lineup and experience the power of emotion.